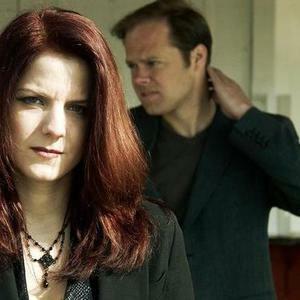 Technoir is an electronic band formed in Germany and consists of Steffen Gehring (music, production) and Julia Beyer (vocals, lyrics). They released three albums so far: Sea Level in 1998, Groundlevel in 2001 and Deliberately Fragile in 2007. The band name "Technoir" came into Steffen's mind while watching the film "The Terminator", in which a club with this name played a role. In the following time he produced the album "Sea Level" in his home studio. "Sea Level" features dark, almost frightening hard electro sounds, but has never been released. The band name "Technoir" came into Steffen's mind while watching the film "The Terminator", in which a club with this name played a role. In the following time he produced the album "Sea Level" in his home studio. "Sea Level" features dark, almost frightening hard electro sounds, but has never been released. Together with Stephan Kalwa from Plastic Noise Experience the very atmospheric instrumental album "Eigenspace" was recorded, also unreleased. Knowing not to create something new with hard electro and dark and distorted male voices, Steffen started looking around for a female singer which he found in Julia Beyer that he met in 1999 at a concert of the band Inside (defunct project of Psyche singer Darrin Huss) where Julia was singing background vocals. With a lot of both musical and live experience made prior to Technoir, Steffen and Julia began developing new songs as a team. The first song they recorded was "Last Tears". Julia had been singing in several bands before joining Technoir (e.g. Inside) where she could make use of what she learned from many years in a professional choir. Steffen is not a newcomer on the scene either: He has been live-keyboarder for electro-heroes Plastic Noise Experience and comes from a musical family in which a classical piano education is both obligatory and cherished. Shortly after sending out the first demos, they found a partner in the German label Bloodline. The first releases "Requiem" (MCD 27.08.2001) and "Groundlevel" (CD 15.10.2001) hit the German alternative charts immediately, also the press showed themselve impressed. This also attracted the attention of bigger companies and so in 2002 Sony published a very danceable Coverversion of the Killing Joke-Song "Love Like Blood" which has been produced by Olaf Wollschl?ger under the project name Blacklight feat. Technoir. The Single was released on vinyl and is featured on the well-known and very popular Dream Dance-Compilation 25. In the same year the duo could present themselves on bigger festivals like the Eurorock Indoor and the Wave-Gotik-Treffen. In 2003, Julia joined the reborn Eternal Afflict and contributed vocals to the album "Katharsis" whereas Steffen supports again the Band Plastic Noise Experience at live gigs after a long break. After the appearance of Eternal Afflict on the Pluswelt Festival in 2004, Julia left the band to fully concentrate on Technoir. Besides writing new songs, Steffen also proved his remixing skills with providing intriuging Technoir-versions of songs from bands like Psyche, Eternal Afflict, O.V.N.I. (Seize side-project) and Agonised By Love. Meanwhile Julia has been in demand as a guest singer with adding some soaring vocals to Melotron's "Folge mir ins Licht" that soon became a proper single and club hit. Furthermore, she delivered guest vocals to releases of In Strict Confidence, Rotersand and Distorted Reality. After the release of the "Manifesto EP" in August 2006, the band has now in stock their second album "Deliberately Fragile". In the meantime, Julia Beyer left Technoir in 2008 to join the heavenly voices band Chandeen and collaborated with English band Mesh on the song Who Says from their album A Perfect Solution.